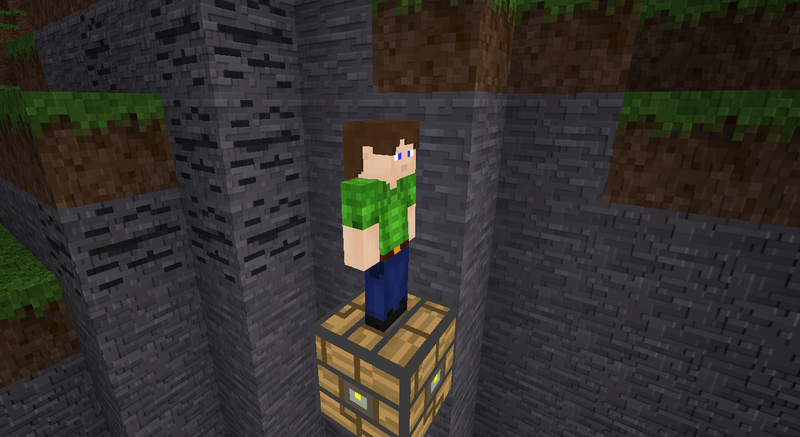 Introducing simple lifts for minetest! If you want to stop the lift at any time, press the "use" key. Place this in front of a lift shaft with a lift block and you will be able to call the lift! *Sorry my website is dead at the moment so I cannot host the download at the moment so you will need to download from this link and rename the folder "lifter"
Last edited by Splizard on Wed Jun 29, 2016 15:30, edited 2 times in total. Games: The Hungry Games Mods: Lifters (Simple Lifts), Snow Biomes and Gates. Also checkout my texture pack Gridtoon! Nice mod, I like the idea of having a way to get up on high hills by using this node/entity. Naj wrote: There is still missing something but I don"t know how to do it : possibility to "call" the lift when it is deeper or higher. That's not possible. The entitiy removes and replaces itself with a regular node if there's no player attached to it. Its possible to call the lift, its just thinking of a simple way of doing it! Perhaps you could introduce a proximity mechanic to call the lift. For instance, have a block to one side of the lift shaft. When active, look for a lif block within, say, 100 meters up or down. If yes, then call it. Another possibility would be to add control blocks that move the (empty) lift up or down. You might need to add the ability to name lifts, so you can specify which lift a controller goes to. It's not quite a call button, but it is close. I have implemented lift doors, they work quite well :) They can be a little bit buggy so just be warned, this is version 0.2! Btw, lifter_door missing textures, probably could be reused door textures if lifter door textures aren't yet ready. I like mod simplism aspect. I must have missed uploading it! I would normally have a user friendly download, I will get my website up with the mod featured. Splizard wrote: I would normally have a user friendly download, I will get my website up with the mod featured. Now back to mod. I did not figure out how lift doors work (doors opens but lift does not moved down), but I finally learned how move lift down :) (found info in first post). My suggestion would be add one chat command for player who step in lift just to remind that what keys he can control lift. it points to line 93 in init.lua. Tmanyo wrote: I get this error. Are you using a development build of Minetest? Getting the same error as @Tmanyo on 0.4.14-dev(debug build). diehard139 and tmanyo you can also use an older version of this mod if you don't want to update minetest_game. I use latest development version of minetest under windows 10 64 bit. Could you also make lifters connected to each other. Than we can make a bigger elevator. And maybe on_step function to link player to lifters. Than we dont have to right click on it. mahmutelmas06 wrote: I use latest development version of minetest under windows 10 64 bit. I can confirm that the issue that mahmutelmas06 is having is present on Ubuntu 16.10 too. I just built Minetest a couple days ago too. Added fix in pull request.